What sort of floor tiles did you use? They look amazing! Vanity colour - Can you share the colour name of the blue vanity? Create a balanced symmetry There’s nothing more soothing and relaxing than a neatly designed bathroom, and as Art Deco style favoured symmetry, it’s a great source of inspiration for a well-planned layout. If you can squeeze in a double vanity with dual basins, mirrors and lighting, the pleasing aesthetic created from the symmetry will encourage you to unwind. 17. 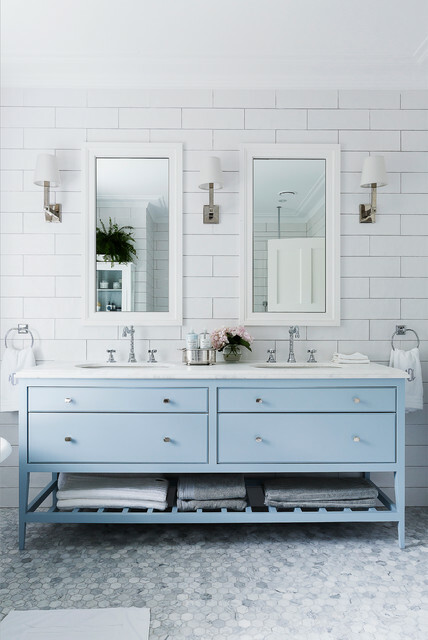 Location: Wahroonga, NSWWhy we love it: There’s a satisfying sense of symmetry with this double vanity, and this has to be the prettiest shade of blue imaginable. Winner: Milestone BuildingThe colour palette strikes just the right chord in this popular bathroom, and the marble vanity top and floor tiles give it a touch of luxe.